So easy and so flavorful, this version of Slow Cooker Pork Carnitas (or Mexican Pulled Pork) is just as fantastic reheated the next day, or even after freezing! 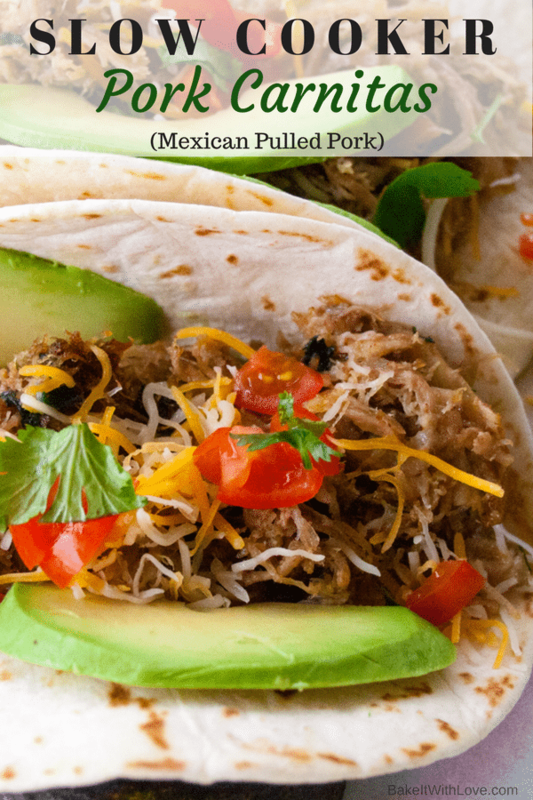 This amazing slow cooker pork carnitas crock pot recipe is so easy to make (as slow cooker recipes are) and the results are just superb! 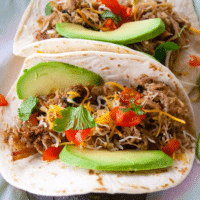 We usually pair our crock pot Mexican pulled pork with our fresh, home made flour tortillas and pico de gallo or salsa verde as well as some more cilantro, avocado or homemade guacamole, and pineapple chunks. Our family loves taco night, but when the same old ground beef gets old we like to spice it up with different meats. 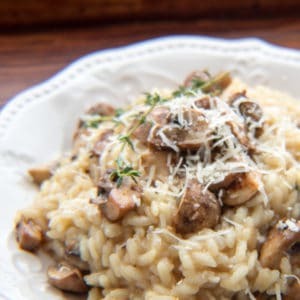 This is a great dish to make alot of as it stores and freezes so well. Be sure to skim any fat from the liquids remaining in the crock pot, then use the liquids when frying up your pork carnitas for serving that evening. If refrigerating for later, store with enough liquid to be able to pan fry the meat later (the juices will soak into the meat for the same tasty result). Same goes for freezing your pork carnitas pulled pork. Be sure to store it with enough juice for reheating once thawed. 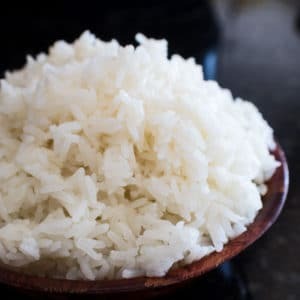 The juice has the majority of your flavor from the cooking process, so you are adding the flavor back into the meat when cooking it before serving. Tasty!! This recipe is perfect for freezing (include the juices from your crock pot) and cooking up another time! Combine taco seasoning mix, chipotle peppers (diced) and the adobo sauce they are packed, and olive oil in a small bowl. Coat all sides of your pork shoulder with the seasoning mixture. 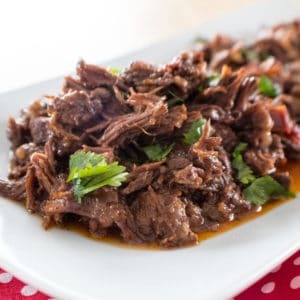 Place seasoned pork shoulder portion into your slow cooker and set to low temperature (to cook for 8 hours) or high temperature (to cook for 6 hours). Squeeze fresh oranges or add orange juice directly onto the pork in the slow cooker. Cover and cook for 6-8 hours, then remove the pork to a large serving plate or platter and shred. Skim fat from the liquid left in the crock pot and ladle about 1 cup portion (if using about half of your shredded pork) into a bowl for pan frying your cooked pork carnitas meat. Heat a large skillet or frying pan to medium high heat and brown the pulled pork, adding the liquid in gradually while cooking. When the liquid has steamed off, add more about a ladle full at a time until the pork carnitas meat is browned and slightly crispy on the ends. Serve immediately and enjoy! To store leftover pork carnitas meat, refrigerate in an airtight container with enough of the liquid remaining in the crock pot to cover about an inch of the bottom of the container. If freezing, also include an adequate amount of the slow cooker liquid when packaging as it contains the majority of your seasoning and flavor.